VARTA® offers enhanced flooded battery (EFB) products that deliver superior reliability and performance compared to standard lead-acid batteries for automotive and commercial vehicle applications. Our batteries are built to meet customers’ individual needs and are manufactured in facilities throughout Europe to meet the highest quality standards. EFB batteries support applications that operate at a partial state of charge and don’t require the deep-cycling characteristics of an AGM battery. A polyfleece scrim material, added to the positive plate surface, makes this possible. This helps to stabilise the active material of the plates, which increases the endurance. More than twice the partial state of charge and deep-cycling performance of conventional batteries. Support for a high number of engine starts and extended engine-off periods. Improved charge acceptance compared to conventional flooded batteries. Designs available that improve thermal stability for use in engine compartments and hot climates. Ideal for start-stop vehicle technologies without regenerative braking technology and for vehicles with higher-than-normal energy demands, whether that means a tougher drive schedule or multiple accessories and equipment installed. In addition, our EFB products are built with PowerFrame® grid technology for high starting power and reliable performance. The unique VARTA® Promotive EFB is a specifically designed battery for high-performance commercial vehicles and is the state of the art in acid stratification and vibration resistance. 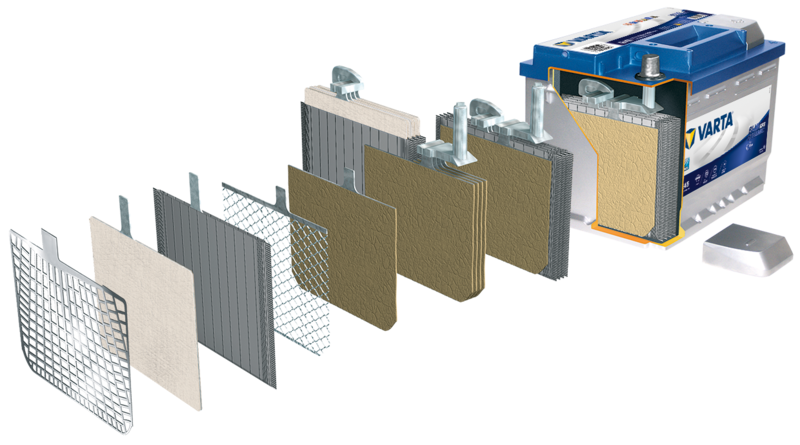 It is the only product in the market with mixing elements, exclusively developed and patented by Johnson Controls. EFB technology ensures reliable performance for all highly demanding applications and is ideal for end-of-frame installation. A unique mixing element inside reduces acid stratification and is an optimum solution for all deep discharge applications. It’s a mechanical system that uses vehicle inertial forces to aid the mixing of acid in flooded batteries. Superior internal fixations with best-in-class hot melt: Very high vibration resistance and perfect fit for end-of-frame installation ensure highest product performance. The unique Labyrinth Lid design provides 100% spill protection and very low water consumption. High cycling ability is guaranteed by using PowerFrame® technology, improved positive paste and grid-to-mass adhesion. A polyfleece scrim material, added to the positive plate surface, sustainably improves cycle life performance. Scrim is an additional polyester element between plate and separator. The scrim holds the active material in place inside the plate and avoids the erosion of mass. The result: enhanced deep cycle resistance and superior charge acceptance. The glued fleece helps the plates keep their proper position at all times and in every condition. The acid circulator avoids acid stratification. It’s a construction element that uses the natural movement of the vehicle to keep the acid inside the battery in constant circulation. The acid density stays at homogenous levels, which enhances charge acceptance and extends the overall battery life. To find a specific battery please type in your part number into the box.